With about of 7% of deaths in patients with sickle cell disease being due to anaesthesia and surgery, perioperative management of these patients involves meticulous care in avoidance of sickling of red blood corpuscles. Cardiovascular complications of sickle cell disease ranging from hyperdynamic circulation to myocardial infarction and cardiomyopathy pose a challenge to anaesthesiologist. Development of Rheumatic mitral stenosis in these patients can become an anaesthesiologist’s nightmare. Hypotension, hypoxia, acidosis, congestive cardiac failure in these patients are a result of interplay of a multitude of factors. In the United States of America, 8% of black population has sickle cell trait & about 1% has sickle cell anaemia12. With about 85% of children & adolescents with Sickle cell anaemia & about 95% of patients with sickle cell disease surviving beyond 20 years of age8, the potential for delayed manifestations of sickle cell disease16and association with other comorbid conditions is increasing day by day. Also ,these patients are being subjected to anaesthesia & surgery for the comorbid conditions. However , about 7% of all deaths among patients with sickle cell anaemia are related to surgery16. Sickling of red blood cells is aggravated by factors like lowered oxygen tension, acidosis, hypothermia, hypovolemia which may develop during anaesthesia and surgery. The cardiovascular complications of sickle cell disease ranging from hyperdynamic circulation( secondary to effect of anaemia) to as severe as cardiomyopathy and myocardial infarction9 pose an additional challenge to the anesthesiologist. In tropical countries like India , the prevalence rates of Rheumatic heart disease in patients hospitalized for heart disease ranges from 25%-60% (average 40% ) 1 . The prevalence among school children varies from 1.8/1000 to 11/1000 with a national average of 6/1000 1. As the vast majority of immigrants to the United states of America in last two decades have been primarily from country of origin where rheumatic heart disease is the first or the second leading cause of death2,5, healthcare workers in the United states of America as well as western Europe may be faced with treatment of such patients even though the incidence and prevalence of Rheumatic heart disease in these developed nations has been on the decline2,11,14. The most common valvular heart disease in these developed nations is Mitral valve prolapse with a prevalence of 5%- 10% 24. Perioperative management of a pediatric patient( 12 year old boy weighing 42Kg) with both the above mentioned conditions involves a fine balance of hemodynamics & laboratory parameters in order to achieve a good outcome. A 12 Year old boy weighing 42 kg residing at an orphanage presented to the pediatrics outpatient department with complaints of breathlessness on exertion (NYHA Class I) since the last 2 years which had gradually progressed to NYHA Class III. Patient also gave a history of paroxysmal nocturnal dyspnoea. There was no history of orthopnea. Patient also complained of palpitation at rest since last one year. Patient gave a history of fever with migrating joint pains involving right lower extremity initially followed by the left lower extremity. This was followed by progressive breathlessness one and a half years ago, followed by swelling over both feet one year ago. Patient was treated with parenteral & oral medications in a private hospital(details of the treatment were not available). Patient also gave a history of lump in abdomen on right side since the last 2-3 years which was not associated with pain & jaundice. However, patient passed dark yellow coloured urine on & off. On general examination patient had stable vital parameters with pulse of 104 per minute, regular with blood pressure of 104mmHg systolic & 86 mmHg diastolic. Pallor & icterus were observed . No edema or lymphadenopathy was noted. There were no signs of puberty. Anthropometric examination revealed body weight of 42 Kg, height = 126 cm. Examination of the cardiovascular system revealed precordial bulge in 4,5,6 intercostal space with a “tapping” apex beat in the fifth intercostal space associated with a diastolic thrill in the mitral area. Parasternal heave was also noted. On auscultation in the mitral area the first heart sound was loud with a diastolic murmur (grade IV/VI) , non radiating, best heard in left lateral position with the bell of the stethoscope. Examination of the gastrointestinal system revealed enlarged liver span 14 cms with 4 cm below the costal margin with an enlarged spleen palpable 8 cm below the costal margin. All the quadrants of the abdomen moved freely with respiration .There was no evidence of free fluid in abdomen. Examination of the respiratory system & the central nervous system revealed no abnormalities. Ultrasound examination of the abdomen revealed hepatomegaly with splenomegaly. X-Ray chest revealed cardiomegaly with straightening of the left border of the heart with pulmonary plethora. Two dimensional echocardiography was suggestive of mitral stenosis- mostly rheumatic in origin with mitral valve area of 0.7 cm2 with a mean transvalvular diastolic gradient of 15 mm Hg across the mitral valve and a peak transvalvular diastolic gradient of 26 mm Hg across the mitral valve . Welkin’s mitral valve score was 7/16. Left atrium was dilated (8cm X 6cm) with no clots or vegetations. Pulmonary artery systolic pressure by TR jet was 50 mmHg. Left ventricular ejection fraction was 60%. Patient was transferred to department of cardiothoracic & vascular surgery followed by decision to schedule the patient for closed mitral commissurotomy , considering the cost & complications of the procedure. After complete evaluation Patient was put on oral digoxin 0.25mg once a day . Patient was on Tablet Ferrous sulfate 100mg , Tablet Folic acid 500 mg once a day , Tablet Hydroxyurea 15mg/Kg /day for sickle cell disease. A Hematology reference was done in view of sickle cell disease. Advice to build up hemoglobin up to 10 gram% & Hbs <30% before posting for surgery was given. Patient was transfused with two packs of whole blood(no exchange transfusion was given) & preoperative hemoglobin was measured to be 10.8 gram%. Repeat hemoglobin electrophoresis was not done due to financial implications. Preoxygenation with 100% oxygen for 5 minutes was done. Patient was premedicated with Injection Glycopyrollate 0.004 mg/Kg , Injection Fentanyl 2μg/Kg followed by induction with Injection propofol 2mg/Kg & Injection atracurium0.5mg/Kg. Oral intubation with Poly vinyl chloride endotracheal tube 6.5 was done following direct laryngoscopy, the duration of which was less than 10 seconds. Anaesthesia was maintained with positive pressure ventilation with oxygen & nitrous oxide using closed circuit. Patients Central venous pressure(CVP) & urine output were used as a guide to intravenous fluid infusion with CVP maintained at 6-8 cmH2O & urine output at 1ml/Kg/hr. Hemodynamic stability was maintained with pulse(60-80) & blood pressure(systolic 100-120 mmHg, diastolic 70-80 mmHg ) maintained in the normal range. Transient vasopressor support with Injection Phenylephrine(20 mg in 250 ml 5% dextrose) was used as 1 ml bolus as & when required . Core temperature was monitored using nasopharyngeal temperature probe and was maintained( 36? C – 37? C) with the aid of active warming methods. Oxygen saturation was maintained 98%-99% throughout the intraoperative period. Closed Mitral commissurotomy is performed in left lateral position. A left lateral thoracotomy approach exposes the left atrial appendage & left ventricular apex. Mitral valve commissurotomy involves putting a finger through the left atrial appendage to guide the tubb’s dilator entered through the left ventricular apex10. The tubb’s dilator once positioned at the mitral valve is opened to the predetermined diameter( 2.5cm – 3.5cm) & leads to cessation of circulation during the period of dilatation. The dilatation proceeds till the full opening of tubb’s dilator is achieved or the surgeon senses the regurgitant jet10. At the time of mitral valve commissurotomy , there was cessation of circulation for 4-5 sec so an arterial blood gas analysis was done post –commissurotomy which revealed pH = 7.293, pCO2 = 40.2 mmHg , pO2 = 188.7mm Hg, HCO3 = 18.4 meq/L, Base deficit = 4.6. In view of metabolic acidosis , Injection Sodium bicarbonate (7.5%) 60 ml was administered. Repeat arterial blood gas analysis done after 30 minutes showed no abnormalities. Duration of surgery was 53 minutes & the total anaesthesia time was 68 minutes. At the end of surgery, Injection Fentanyl 2 μg/Kg was administered intravenously and patient was transferred to intensive care unit for mechanical ventilation. In the ICU, temperature , hemodynamic stability and urine output were maintained. Hemoglobin, Hemoglobin electrophoresis, urine microscopic examination were sent for in the postoperative period . Results showed Hb = 9.8grams %, Hbs= 52.3%, HbF 46.5%, Hb A2 = 1.2%. Patient was extubated after 4 hours of admission in ICU. Patient had an uneventful postoperative course & was discharged from hospital on seventh postoperative day with the electrophoresis reports for future reference. Sickle cell disease is characterized by sickling of red blood cells on deoxygenation due to a mutation in the ß globin gene that changes the sixth aminoacid from valine to glutamic acid3. Dehydrated & rigid sickled cells can cause tissue infarcts by impeding blood flow & oxygen to tissues15 . Sickling of red blood cells is aggravated by factors like lowered oxygen tension, acidosis, hypothermia, hypovolemia . The cardiovascular complications of sickle cell disease include hyperdynamic circulation, cardiomegaly , conduction blocks( atrioventricular block, bundle branch blocks), cardiomyopathy & Myocardial infarction9. Development of Rheumatic valvular heart disease- mitral stenosis can further complicate the clinical picture in these patients. Hypotension, hypoxia, acidosis, congestive cardiac failure in these patients are a result of interplay of a multitude of factors( low cardiac output, backpressure changes in the pulmonary circulation, decreased ventricular compliance). Dilatation of the stenosed mitral valve improves the cardiac function & reduces the incidence of sickling of red blood corpuscles in these patients. The treatment modality of mitral stenosis has undergone a reorientation with the introduction of percutaneous mitral balloon valvulotomy, which has proven to be safe and provides short and long term improvements in symptomatic and hemodynamic status7.However in developing countries like India , the cost of percutaneous balloon mitral valvulotomy has been estimated to be six times that of surgical closed commissurotomy whereas in the United States of America, the cost of percutaneous balloon mitral valvulotomy is half of surgical closed commissurotomy22. The difference is primarily because of the higher cost of single use balloon catheters in developing countries like India. Therefore surgical closed commissurotomy remains the treatment modality of choice in countries where Rheumatic mitral stenosis is endemic6,7,4 and where resources and facilities are limited17. In the present case , this patient was subjected to closed commissurotomy due to cost constraints even though the facility of percutaneous balloon mitral valvulotomy is available in our institution. Stress response to surgery & anaesthesia starts right from shifting the patient to the operating room area . Sedatives/ narcotics administered night before surgery may very well decrease the stress response however predisposes the patient to hypoxia. In this patient , we wanted to avoid tachycardia as well as hypoxia. After consultation with surgeons , it was decided not to administer any sedative night before surgery in order to avoid hypoxia. However, on arrival in the preinduction area patient was given Injection Midazolam intravenously & put on oxygen by mask with monitoring being done by pulse oximeter. Hypovolemia in the preoperative fasting period was avoided by adequate fluid infusion with urine output monitoring. Intraoperative maintenance of hemodynamics involves maintaining a fine balance between cardiac output, heart rate & central venous pressure. Continuous monitoring of ECG, oxygen saturation, invasive blood pressure , central venous pressure, Temperature was done. Pulmonary artery catheterization is recommended in this case to monitor cardiac output, Pulmonary capillary wedge pressure(PCWP) but was not done due to cost constraints. Fluid overloading in the presence of low cardiac output state due to mitral stenosis predisposes the patient to congestive heart failure however hypovolemia can increase sickling of red blood cells. Fluid transfusion was guided by central venous pressure( 6-8 cm H2O & urine output(1ml/Kg/hr).Blood pressure, Temperature were maintained in intraoperative period . Phenylephrine being a pure alpha agonist produces vasoconstriction with reflex bradycardia thus acting as a double edged sword by maintaining blood pressure & avoiding tachycardia23. Hypothermia aggravates the sickling process & was avoided in the operating room and ICU. At the time of surgical closed commissurotomy, cessation of circulation is associated with accumulation of local products of metabolism in tissues & may lead to local areas of acidosis. Therefore an arterial blood gas analysis done immediately after commissurotomy would indicate alterations in pH & serum bicarbonate levels. As acidosis predisposes to sickling in tissues , correction of acidosis should be promptly done. In fact many practitioners advocate empirical use of sodium bicarbonate in patients with sickle cell disease posted for elective surgery however sodium bicarbonate has its own complications like hypernatremia, hyperosmolarity etc. It was not done in this case . Patients with severe mitral stenosis & pulmonary hypertension should be electively ventilated for 3-4 hours as even slight hypoxia, hypercarbia can lead to marked increase in pulmonary hypertension19. This patient was shifted to ICU for elective ventilation & investigations like Hemoglobin, Hemoglobin electrophoresis ,urine microscopy were sent for. This period of elective ventilation gave time for investigations & stabilization of hemodynamics. 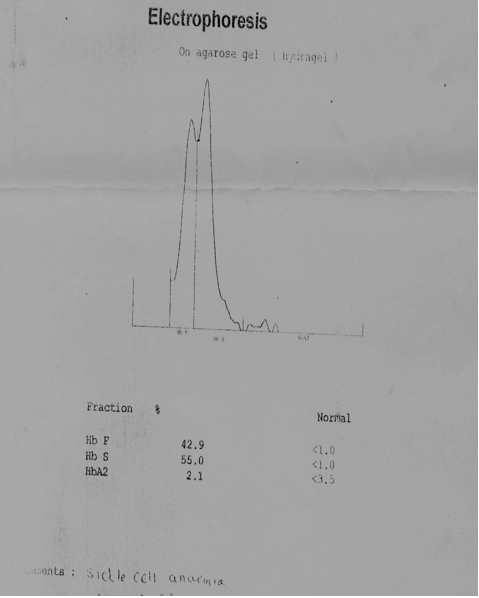 Two packs of fresh whole blood were kept ready had the hemoglobin electrophoresis & urine examination study shown evidence of increased sickling & ongoing hemolysis. Pain management with potent NSAIDS & judicious use of narcotics( avoid respiratory depression) helps the patients breathe better thus decreasing chances of hypoxia & sickling of red blood cells. A high incidence of pulmonary infections & acute chest syndrome has been reported in the postoperative period 19 . This patient was given injection Fentanyl 2μg/ Kg before shifting to ICU and diclofenac suppository 100mg eight hourly thereafter. Good postoperative respiratory care(physiotherapy, incentive spirometry) by a team of respiratory care physicians led to an uneventful course and is strongly advocated. Perioperative management of sickle cell disease patient with rheumatic valvular disease involves meticulous planning of fluid infusion, stress response alleviation, hemodynamic stability, temperature monitoring & maintenance and pain management. Maintenance of all these helps in a good perioperative outcome. However it requires expertise in the management of the variables mentioned above keeping in mind the effect of correction of one variable on the pathology of sickle cell disease & rheumatic valvular disease as well as other variables. 16. Platt OS , Brambella DJ, Rose WF et al : Mortality in sickle cell disease : Life expectancy & risk factors for early death. N Eng J Med 330: 1639-1644, 1994.